The collection is perfect for all your Halloween photos and I’m here to show you some inspiring layouts. You may be surprised at the versatility of the collection. which can be used in other ways as well. And in case you missed it, make sure you grab the coordinating freebie created by Kabra by clicking on the picture below. The composition of Trick or Treat by 6 grand is delightful and spooky at the same time. 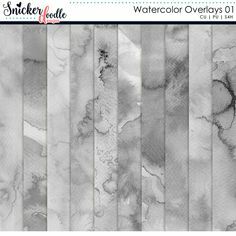 If you love the moon that is part of the paper background, you can check out this tutorial found on the SnickerdoodleDesigns blog: How to Create a Moon in Photoshop. The moon looks amazing, especially combined with the sparkles found in the collection. Renee’s extraction is perfect, and that’s no easy feat. I love the way the ribbon wraps the smaller framed photos placed atop the paper strips. (Those frames with the wrapped ribbon are an element from the Collection!) The clusters, both in front and behind the frames, are lovely; and the arrow serving as her title is a great added touch. I love the photos featured in Halloween 07 by Deanna. 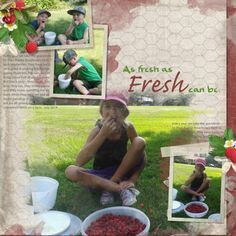 She used a template by Akizo Designs, which was a great choice, and keeps the focus on the photos. The cascading cluster, the tucked journal card with the journaling, as well as the shabby tag with the date all add up to a gorgeous page commemorating this Halloween memory. Trick or Treat by Bright Eyes is another dramatic layout. I think it’s the black and purple that makes the perfect, rich looking backdrop for the swish. which supports her photos and elements on top. She also used the double, ribbon-wrapped frame from the collection. Of course, her photos are adorable. I’m amazed that she was able to incorporate four journal cards since I often struggle with using one. The placement works so well with the composition of her layout. The small cluster, candy scatter and peeking ghost complete the layout perfectly. Zanthia chose to use the orange-toned papers in her layout, Trick or Treat. I think it gives the layout a totally different look than you would get using the black and dark purple and contrasts better with her darling photos. Her clusters are pretty and placed in a triangle, which is always an appealing design trick. I love how she tucked in the journal card to serve as her title and journaling. I actually spotted Sibling Love by rochelle86 first on Facebook. I’m always impressed when people think outside the box and use kits for a purpose other than that which is intended. I love that she kept her photo large. The cluster across the bottom edge is gorgeous and incorporates many of the kit elements for a fall rather than Halloween look. Her title work is awesome, and I really like the font she used. 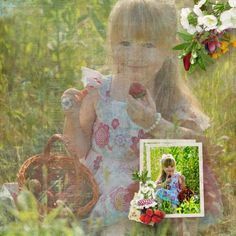 I’ll finish up with another layout using the kit in a creative way, Sweet Treats by Glori2. The baked oatmeal looks delicious and since it’s oatmeal I think you can eat it for breakfast instead of saving it for dessert, right? The full recipe, including baking instructions, can be found on the SnickerdoodleDesigns blog, though Glori modified it to make it healthier. The opposing masked photos, with the recipe, and gorgeous cluster between the photos makes for a wonderful page design. I love the way Glori added her commentary to the arrows, and the bit of lace on the edges frames the layout perfectly. I’ve come to the end of my post, and I hope these layouts have inspired you to create your own Halloween layouts; or, as you can see based on the samples above, layouts on any other subject. I’ll be back on Monday, but in the meantime have a great week and make sure to find time to create something of your own. Thanks!